A repurposed shipping container designed to stimulate conversation, a mobile community space for the public to cook and collaborate, and an intriguing new app featuring lesser-known stories of Honeysuckle’s history will breathe new life into the Honeysuckle foreshore from Friday. Amber Sauni and her project Movable Feast, a collaboration with Warren Reilly. As part of the Honeysuckle Placemaking project, supported by the NSW Government, students, academics and alumni from the University of Newcastle’s School of Architecture and the Built Environment have joined forces to develop innovative projects aimed at activating underutilised spaces along the water-front. The temporary interventions provide facilities for the public to engage with, be entertained by and explore, aiming to attract local residents, tourists and visitors from greater Newcastle, as well as develop key research outcomes on their use to help inform future projects in the area. 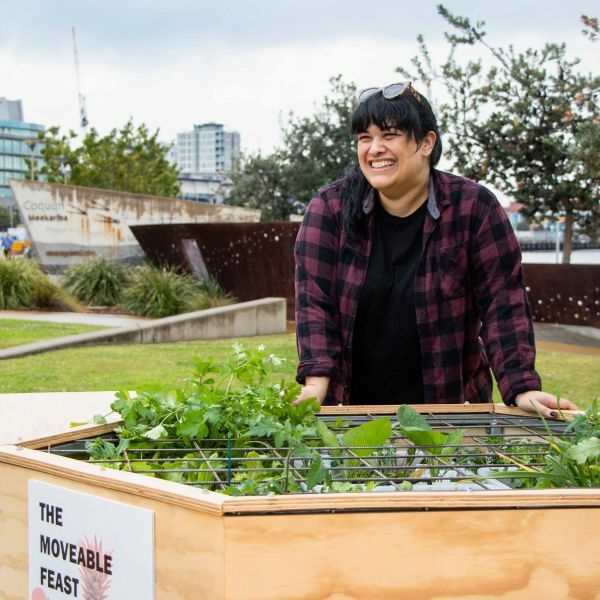 Movable Feast is a temporary installation which invites the local community, visitors and cooks to come together. Designed for up to 32 people, the structure features table and benches, an edible garden, sinks, bbq hotplate and food prep space to promote engaging over food. Chatterbox is a mobile re-purposed shipping container designed to stimulate ‘chatter’ between participants. Incorporating an information booth, recording booth to record oral histories, and community space, the structure is configured to frame key views in the area. Hidden Honeysuckle is a mobile app (apple and android) including historical data and oral histories to direct a self-led tour of the Honeysuckle precinct. Hidden Honeysuckle features quirky stories like that of Carlo the dog from Steel Street, who would ring a bell with his teeth to alert the fire brigade to a fire.